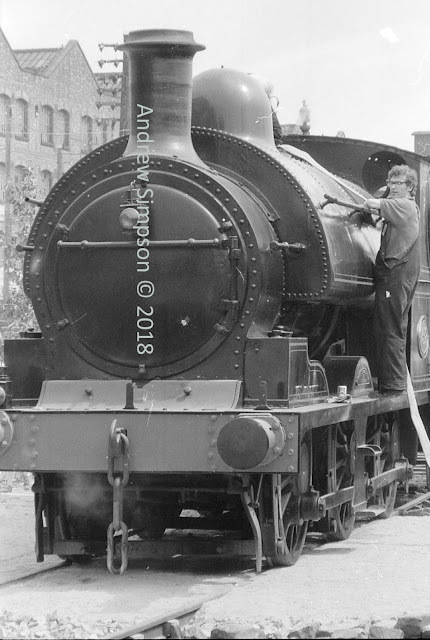 Sometimes to quote that historian “the past comes back to bite you on the bum” and so it was when I uncovered a selection of pictures I took back in 1980 of steam locomotives. And the images were not the bit that did the biting, it was the realization that I am old enough to have travelled on trains pulled by steam locomotives which were in regular service. So not for me the trip on 3 miles of track lovingly restored by steam enthusiasts on a line that died under the direction of Dr Beeching. No, these were main line expresses hurtling north to Derby and Manchester, which places my youth in the 1950s which to quote an equally imminent philosopher means that "I have fewer years ahead of me than behind". But putting all of that to one side the pictures are of the Steam Exposition from 1980 . And it was a day of fun. Down at what is now the Science and Industry Museum a huge collection of people had gathered to watch, drive or ride on a variety of steam driven machines, from railway locomotives to steam tractors with more than a few vintage cars and buses thrown in. So here was the day. And over the next few weeks a few more of the pictures will make their way on to the blog.